The Aurora Consurgens is an alchemical treatise of the 15th century usually attributed to Thomas Aquinas. Written as a commentary on the Latin translation of the al-Mā’ al-Waraqî wa’l-Ard an-Najmīya (The Silvery Water and the Starry Earth) by Senior Zadith (Ibn Umayl), alchemist of the tenth century, it seems to fit well as a title for the project proposed to Da Vinci Classics by the Ensemble Rosaces. Their idea of music could be not farther from a philological reconstruction; at the same time, it could be considered even close to an original ancient idea to perform the ancient improvisation performed nowadays. Hard to define univocally, their performance boundaries spread from an unconventional approach to the music by Matteo da Perugia, with a real alchemical fusion with ancient-like contemporary improvisations that constantly “trope” the original text. Such a unique idea of performance should not frighten the use of a guitar, an instrument surely not as ancient as the music performed, that, in this “retro-avantgardistic” context, sounds unimaginably well. Matteo da Perugia was, as his name stated, presumably from Perugia. First magister capellae and the only cantor at the as yet unfinished Milan Cathedral from 1402 to 1407. His duties as described in the cathedral records were to ‘biscantare’ during solemn feasts as well as to teach music, but the date of his birth and death are unknown. The last record of him in Milan Cathedral dates to January 1418, which, does not contain a notice of Matteo’s death, but merely records a complaint by Matteo’s successor, Ambrosino da Pessano, that his salary was not as high as Matteo’s had been. His surviving compositions include mass movements, two isorhythmic motets and both Italian and French secular songs, some of them presented in this recording. The German-American musicologist Willi Apel regarded Matteo as the principal composer of his generation, in whose compositions one could trace the stylistic transition from mannerism to the ‘modern style’ of the early 15th century. Even if other musicologists, as Heinrich Besseler, challenged this viewpoint, Matteo’s position in history is still an open question. 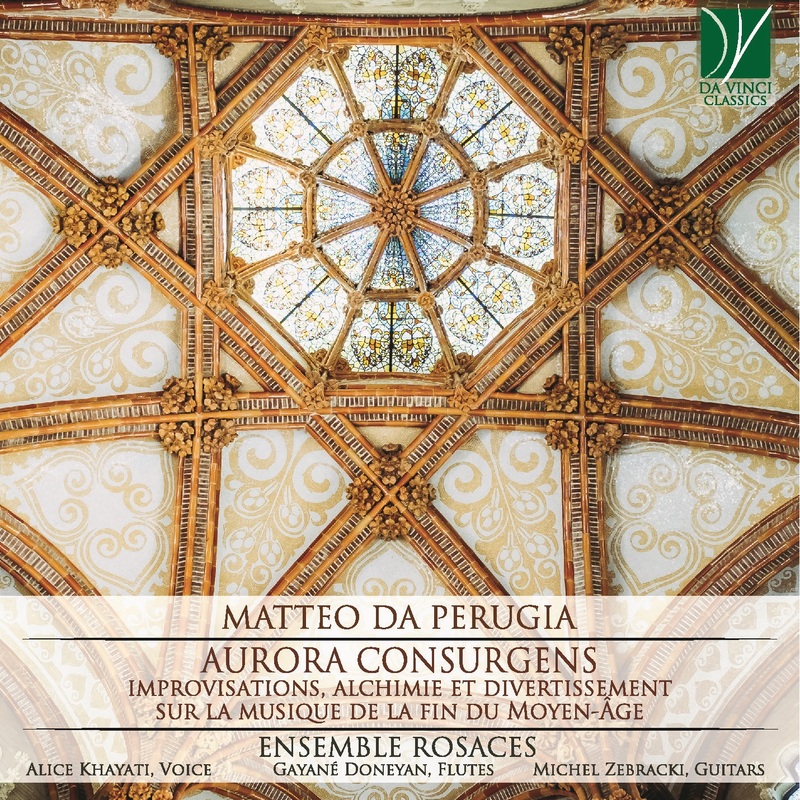 This cd contains a miscellanea from Ballades (as Pres du soloil), Virelais (as Ne me chaut) and Rondeaux (as Dame playsans) and connects its music with works of his most distinguished contemporaries like Johannes Ciconia or Paolo da Firenze and Guillaume de Machaut, the latter one often an inspiration for Matteo’s compositions as in Se je me plaing de Fortune that quotes the opening texts and the first eight bars of cantus and tenor of Machaut’s Se je me plaing and De Fortune me doit plaindre. As the old alchemists studied how to change basic substances (such as metals) into other substances (such as gold), the main aim of the Rosaces in this Aurora consurgens is to transmigrate the soul of this music into a modern heart and imagine how this two worlds that are so far away can communicate with modern times. At the same time, they pay homage to one of the greatest composers of the medieval period, setting a long-shot for possible use of medieval music as groundwork for something entirely new. Ensemble Rosaces: Far from any historical reconstruction, the ensemble Rosaces with Alice Khayati (voice), Gayané Doneyan (flutes) and Michel Zebracki (guitars & arrangements), tries to appropriate the swan song of an era, creating connections with the modern music through its rhythmic wealth, great polyphonic freedom, its latitude for improvisation. And even if it is a real squaring the circle, the musicians trie, through this imaginary and flamboyant journey to cross ages, to experiment with time, in other words, how to make this timeless modernity resonate nowadays. Since its creation in 2015, the group performed in Burgundy, Nantes, Auvergne, Brittany and Paris area. In November 2016, when their first Album as a Duo was released, Rosaces played at the Péniche Anako (Paris), and took part of the competition for young talents as part of the "Chambre avec vue" Festival (Rabastens). Following the "Musique en Breysse" residency, the group is extended with the arrival of Alice Khayati, becoming a shape-shifting ensemble, and in September 2018 recorded in trio in Morsasco (Italy) for Omk-Da Vinci the "Subtiles Renaissances" programm after Matteo da Perugia (active between 1380 and 1418), a musical creation with "great contamination between early music and jazz".